These guys get to do something great about a terrible situation. Though we wish it weren’t true, one out of three girls and one out of five boys will face sexual abuse in America. Over 70 percent of the children that die from neglect or abuse will be under the age of three. Today, victims of abuse are being given a greater voice than they've ever had in the past. People are speaking out about these heinous crimes, fighting to stop them, giving greater awareness of the occurrences, and making certain to persecute the people responsible. But one group takes that responsibility a step — or a ride — further. Meet B.A.C.A. 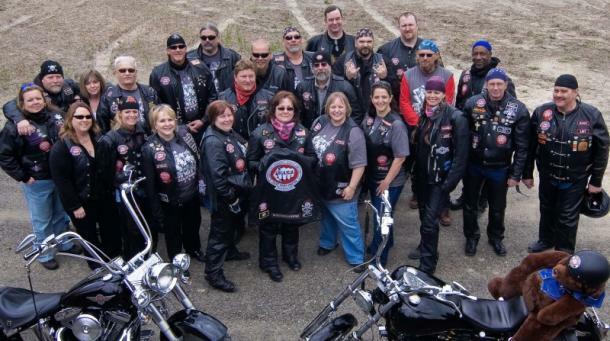 : Bikers Against Child Abuse. These men and women have joined together to help child abuse victims gain their self-esteem and respect back by giving them something that was taken from them: safety. They let their outer appearance scare the bad guys away, while showing the children nothing but love, and giving them the confidence to deal with their abusers, whether it’s court or every day life. Abuse of any kind can devastate a child mentally, physically, or emotionally. But thanks to B.A.C.A., at least these children can sleep at night, feeling safe from their own personal bogeyman. “We set up on all four corners of the property, and let her know that no one was going to come into that house and harm her, because they were going to have to go through us,” Tombstone says. B.A.C.A. does whatever it takes to make certain that abused children know they’re safe and secure, even if that means escorting them to therapy or court appointments, or even spending all night camped out in front of their houses. One day, we can hope that abuse is a thing of the past. But until that day, it’s good to know that groups like B.A.C.A. will continue to fight for children in abusive situations. ​Learn how to donate to B.A.C.A. and help them protect other child abuse victims by clicking here.